Starting your day with a morning meditation is the perfect way to get yourself going. If you are experiencing a lot of stress or anxiety, then a short meditation in the morning may greatly improve how you feel throughout the day. Meditating in the morning can help influence how your day is going to go. Meditating has been found to have many health benefits. Meditating daily can help balance your emotions, boost your immunity, and increase your energy level. Those are just a few of the benefits of meditation, and the positive impacts of meditation can be different for everyone. The more regularly you meditate, the more benefits you will see. One Medical provides tips on how to get started with a morning mediation. Here are five tips to help you through your meditation. Dress Comfortably- One of the best parts of a morning meditation is that you can meditate in your pajamas. To stay warm, you may want to wear a sweatshirt or grab blanket. Find a Quiet Place- If possible, find a place you can mediate in every morning. Make sure it is somewhere you will not be disturbed. You can make your space more comfortable with things like pillows and candles. The most important thing is that it is somewhere that you can sit comfortably. Focus on Your Breath- Take deep breaths and feel your breath move through your body. You can also direct your attention to your third eye, the area just above the center of your eyebrows, and continue to breath in and out. Relax Your Mind- Just let your thoughts come and go freely. Don’t focus too much on what comes into your mind. Let go of reactions to your thoughts. 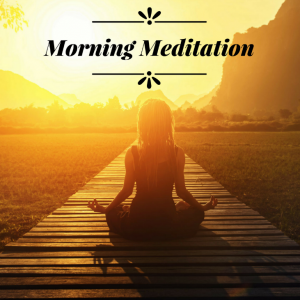 Mediate Every Morning- It is important to keep practicing. Some mornings your meditation will be better than others, and that is okay. There might be mornings when you just want to sleep in, but try your best to still get to do your meditation. Remember the way you feel after your meditation, and overtime you will see the benefits of meditation. There is no time like the present to start your morning meditation. All it takes is setting your alarm 10-15 minutes earlier to be able to do your meditation practice. Remember its important to try and stay in a rhythm and complete your morning meditation every day. If you think you need a little more guidance to be able to meditate there are many apps available to help you through a guided meditation that you may find helpful. There are also various videos to help assist you in your morning meditation as well. Try your morning meditation a few times to see what works best for you and stick with it. You will see all of the wonderful benefits of meditation in no time.